The kidnapped commander is Col. Nadim al-Hasan, a Turkmen from Manbakh east of Aleppo who had defected from the Syrian Arab Army to join the rebels. He is alleged to have been trained in Turkey to lead a “Turkmen Front.” (Turkmen are an ethnic minority in northern Syria who speak a language related to Turkish). Another FSA officer taken was Farhan Jasim, known as Abu Hadi. Reports of 7 to 18 troops kidnapped have also circulated. Obviously, having US-trained fighters captured by al-Qaeda in Syria is embarrassing to the Pentagon and the Obama administration. The Department of Defense pushed back against the story Thursday afternoon, insisting that none of its trainees has gone missing. But all that means is that the troops and the commander abducted from Division 30 were not themselves drilled by the US. That they were captured still reflects badly on their 56 colleagues who had been so trained. (The Department of Defense may also mean to say that the particular unit that was taken had been Turkish-trained, not US trained– see below). 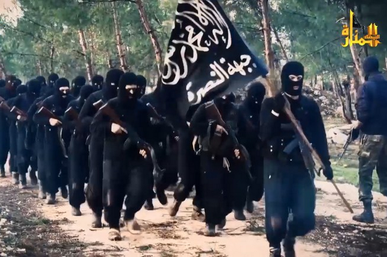 Al-Qaeda in Syria appears to have targeted them precisely because of their ties to the US. Indeed, the operation might have been ordered by al-Qaeda leader Ayman al-Zawahiri, one of the masterminds of the September 11 attacks on the United States. Al-Safir (The Ambassador) zeroed in on another angle of the story. journalist Abdullah Sulaiman Ali, writes. In its announcement protesting the al-Qaeda act of aggression, it called on its “brothers” in that organization to release the Division 30 personnel, using the language of truce. Al-Safir is scathing. So lets get this straight, The US is training Division 30 troops, and then they go out and do a truce with al-Qaeda?! Ali says that Col. al-Hasan and his Division 30 entered Syria after training in Turkey via the Bab al-Salama checkpoint and took up a position in the city of Izaz, which is in an areaa controlled by the Army of Conquest, an alliance of the Salafi Free Men of Syria with al-Qaeda in Syria. Since they were operating in an al-Qaeda-held area, he said, it was easy for them to be abducted. He implies that up until the capture, they were clearly engaged in tactical coordination with al-Qaeda against the troops of Bashar al-Assad in Aleppo. He quotes Abu Omar al-Munbaji, who knows abductee Farhan Jasim, as having written at Facebook that he was surprised by the capture, since Division 30 had met at the al-Qaeda HQ with Jabhat al-Nusra only three days before. He said that al-Qaeda turned on Division 30 because it decided they are American agents. Ali says his sources say Turkish intelligence was surprised by the incident and has contacted the Support Front to see why they captured the men and to see if the dispute can be resolved.